With the closing of Grand Designs Live 2014 comes our reflection back on one of our best weeks so far of the year. With the closing of Grand Designs Live 2014 comes our reflection back on one of our best weeks so far of the year. The entire event was organised spectacularly and the Excel made for a superb venue. It was an absolute delight to see so many other companies throughout the design industry showing off their wares and generally coming together. After months of design and meticulous planning with Columns design company in London, the Shutterly Fabulous stand stood out from the crowd with our bright displays and modern display area. 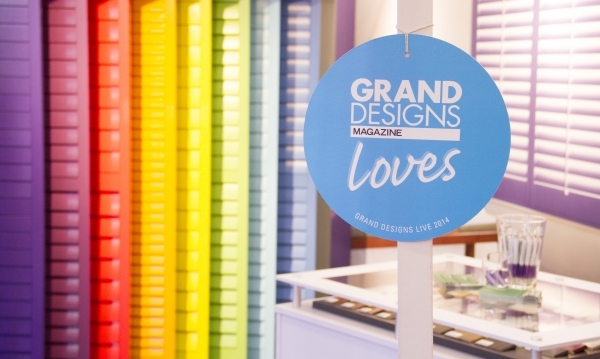 As an added bonus to the feedback from all of you visiting, this was recognised by the organisers who awarded us a ‘Grand Designs Loves’ token for a unique and special display. Thank you to everyone who turned up to support Shutterly Fabulous and to those who met us for a first time there, in addition thank you to our Staff who worked tirelessly through the week to answer your questions.